Preparing for our third year of Spinzilla, we have learned some things that helped keep the stress down during the week of full-speed ahead spinning. 1. Prep Prior to the week – This can’t be stressed enough. For many of us, we work a job, have families and still need to spin a bunch of yardage. We don’t have time in the middle of the week to prep fiber. Every minute is valuable. Wash/scour/process any fleeces you have and get it into a preparation that is easy to spin. Pre-draft any roving that may be compacted or thicker than is necessary. This also means getting your equipment in order. 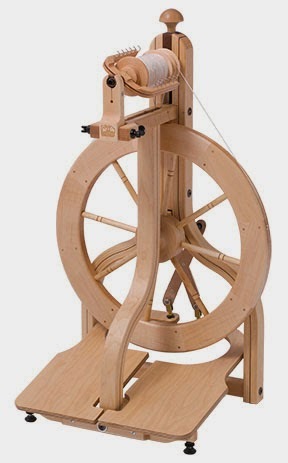 Clear off any bobbins, make sure all of the parts and pieces of your wheel/spindle are in working order, and prepare drive band materials if you aren’t using poly-material. 2. Get lots of rest – We aren’t robots, when you are tired, go to bed. Don’t fall into the trap at 10-11pm saying “just one more ounce and then I will go to sleep.” A refreshed spinner is a productive spinner! 3. Take breaks and stretch – Again, we aren’t robots. Spinning is a very physical activity, and with any activity, stretch before, during and after spinning. Take frequent breaks and avoid stressing fingers, arms, wrists, shoulders, etc, by breaking up your spinning sessions. Posture awareness will help avoid soreness. 5. Oil – When our wheels haven’t been used in awhile, and when they are being used quite a bit, we need to keep them well oiled. We have a video on proper oiling techniques up on our YouTube channel. 6. Refreshments – Keep your favorite snacks and beverages close at hand! Though it may not seem like it, spinning requires is actually physical work. You need to stay hydrated and those calories need to be replenished. If you are hosting a spin-in or two, make it a potluck and everyone can bring their favorite foods along! 7. Have fun! – Though this is a competition and a fundraiser, this event is much bigger than both of those things. It’s about community and coming together to do something we love. Whether you’re on a team, or if you’ve gone rogue, find an event near you to spin with others. And as many spinners know, spinning with others is one of life’s wonderful joys.